Prepared is the first Reason Only Prepared Piano ReFill. A Prepared Piano is a regular piano that has rubber, nails, plastic, and other things stuck between the strings to turn it from a harmonic instrument to a percussion instrument. If you've never played one, there's really nothing quite like it. If you can imagine having an other-worldly percussion section at your fingertips, yours to command, then you have a small idea of what it's like. In addition to prepared piano the ReFill also contains a spinet piano with a unique character all its own. Finally you also get a wealth of dark-to-light keys, gritty bass, bizarre and beautiful drum kits, and other sounds for many genres. There are two instruments that comprise the heart of Prepared. There is a prepared piano and a spinet piano. 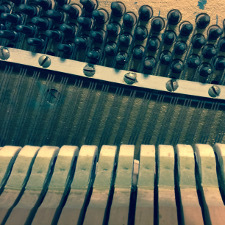 The prepared piano is sampled with three or four velocity layers per note, with roughly half the keyboard having each individual prepared note sampled. The spinet piano has the same number of velocity layers but fewer samples across the keyboard. We avoided any "problem" notes so you wouldn't have to (she's a thirty year old piano - she's got a few problems, but we won't judge). Altogether there are over 500 cleanly recorded, individual samples making up the entirety of Prepared.